This Irish blessing plaque features a hand painting on a wooden sign. This Irish blessing plaque offers the Luck of the Irish. This Irish blessing plaque features a hand painted message on a distressed wooden sign that is enhanced with primitive appearance. The Irish blessing sign is made of wood and measures 18" wide x 8" tall and it is ready to hang on your wall. 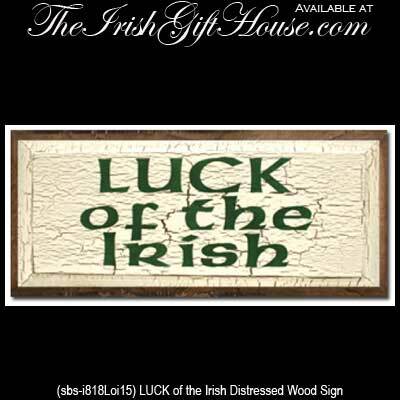 This wooden Irish sign, from The Irish Gift House, is made in the United States. Each sign has its own unique characteristics such as distinctive grains, cracks, notches and other slight imperfections that give each sign a unique, primitive apperance.